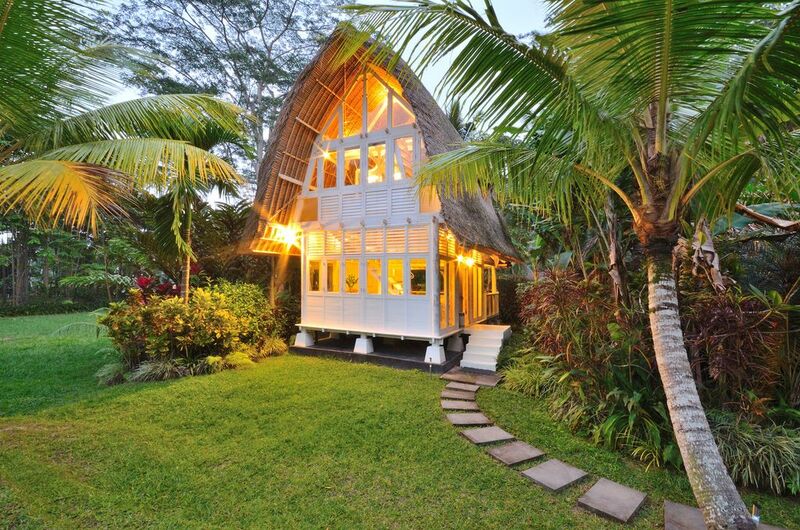 A Village Of Romantic Living Spaces in the Hills Near Ubud: "Astonishing!" Jendela di Bali is a unique private villa in the foothills near Ubud that delivers you from the tourist throng and offers you a window onto an ancient culture. The villa is like a 'village' of unique living spaces including a lounge/dining bale, media entertainment/massage/meditation bale, two romantic guest bedroom bales and a stunning wet edge pool, all set in over 2200sqm of tropical parkland gardens on the edge of a jungle gorge. Surrounded by rice paddies and sacred villages, you are close to Ubud for dining and entertainment but far enough away to immerse yourself in traditional Balinese culture. This is a special place for those who love artistry, value authenticity and seek serenity with style. Jendela di Bali suits those who seek a window onto a living, evolving culture. You are not isolated from real life nor are you wedged within a tourist hotspot. You are close enough to Ubud's dining, art and culture, real coffee and fine dining when you want it, but far enough away to escape. The sounds you will hear are of authentic village life: the sacred, the industrious, the ebb and flow from sunrise to sunset. Nothing you will see or hear is put on for tourists. It is all genuine. If you would like a copy of our Activities & Attractions Guide, Meal Menus, Therapeutic Massage Menu and more please click the 'Contact Manager' link and request a copy and we'll send it to you. * You will have the exclusive use of the whole villa and pool, whether you book one or both bedroom bales. Jendela di Bali as a unique 'village' of living spaces, each artfully hand crafted to reflect traditional Balinese and Indonesian-archipelago architectural styles. Each 'bale' is set within 2200sqm's of verdant tropical parkland gardens with fountains, flowers and vibrant bird life. You will have the exclusive use of the whole villa, whether you book one or both bedroom bales. The heart of Jendela di Bali is the Bale Bengong lounge and dining bale. This generous space offers a grand day bed dressed in regal fabrics, relaxing chairs, an elegant Javan-colonial dining room, fans and French doors that look over the jungle gorge and dramatic black-stone, wet-edge pool. This beautiful bale cooled by fans is the perfect place for massage, meditation, yoga, reading or art work. There is a flat screen TV with surround sound and DVD/CD and cable TV housed discreetly within an antique Java cabinet. This is a dream space like no other. Lie in the elegantly-dressed king bed looking out the stunning glass wall to the moon as it hovers languidly, whilst fireflies dance in the forest before you. Inspired by the traditional Balinese rice barn, over three levels The White Elephant offers a living room, undercover deck with daybed, largely enclosed bathroom opening onto the deck and upstairs is a romantic bedroom and loft on the third level. Each level with ceiling fans. Guest Bedroom Bale - The gracefully arching roofline of The Kingfisher Bale takes inspiration from Toroja design. This bedroom bale sits beyond the pool and palm grove and offers serene gorge views toward rice paddies. Cooled by ceiling fans. The unique shower configuration places the shower-over-bath on the balcony, with a privacy curtain around the bath and blinds on the balcony. The toilet is separate at the rear of the Bale. You can dine beside the black volcano stone pool with its wet/infinity edge, recline on the wonderful day bed or relax in the armchairs made from up cycled former Balinese fishing boats, there is a space and place for you poolside at Jendela di Bali. There is even a hammock strung between a circle of palm trees to settle into and read and relax. Jendela di Bali lies alongside an ancient gorge several stories deep. This natural amphitheater forms a protective habitat for plants and wildlife. Our villa gardens extend this natural habitat by a further 2200 sqm's, providing ponds and fountains for the enjoyment of birds, butterflies and guests alike. The small but well-appointed kitchen is where our beautiful staff lovingly prepare a menu of delicious Balinese and Indonesian meals for guests. We offer ALL meals (Breakfast is included in the rate and a menu offers Lunch & Dinner selections at a modest additional cost). For details please click the 'Contact Manager' link and request a copy of the menu and we'll send it to you. CAR & DRIVER - Whilst staying you may want to visit some of the many fascinating religious, cultural and natural sites near the villa and you will also want to go into Ubud for shopping, cultural performances, etc. At any time during your stay you will have the option to book a car + driver at a reasonable rate with 24 hours notice by telling the villa staff who will liaise with our office. SUITABILITY FOR CHILDREN & ACCESSIBILITY - Because of our setting on the edge of a very deep gorge and the changing levels of the property young children under the age of 8 need to be supervised at all times. The elderly will need to be sure footed and confident and the property is not wheelchair accessible. NON-SMOKING - Please note we are strictly a non-smoking property both inside and outside. RELIGIOUS CEREMONIES & YOUR STAY - Almost every day on Bali there are religious ceremonies. These can be temple events, weddings, cremations, tooth filing ceremonies, full moon rituals and many more. Some of these are at night and involve music and chanting. Jendela di Bali is located at the top of a sacred, high caste village and during your stay you will almost certainly hear these events. Only very occasionally these will occur late into the night but they are a possibility so we warn guests so you can be aware. Some are suitable for guests to ask to attend and others are sacred, holy and thus not suitable to attend. Please ask the staff for advice on attending local ceremonies and be guided by them. We provide the suitable temple/ceremony clothing required to be worn – ask the staff for assistance. Imagine a unique property along a tropical forested gorge, at the top of one of Bali's rare, high caste sacred villages. Nearby, rice fields create a patchwork of verdant green and gold. With a tasteful blend of traditional Bali and Java colonial styles, Jendela di Bali offers a sense of place and spirit that sets it apart. The sounds you will hear are not those of silence. The sounds you will hear are of authentic village life: the sacred, the industrious, the ebb and flow from sunrise to sunset and, on religious occasions, evenings as well. Nothing you will see or hear is put on for tourists. It is all genuine. Distant laughter, chanting, traditional Gamelan orchestras emanating from temples and homes, people bathing, harvesting rice, carving – these are the sounds of people worshiping, creating and living, the sounds of a people in constant motion, whose every act is a crescendo toward worshiping their gods. Wafts of incense, aromas from temple feasts, sweet frangipani and the blinking of fireflies at night blend into an unforgettable backdrop to the Jendela di Bali experience. Jendela di Bali suits those who seek a window onto a living, evolving culture. You are not isolated from real life nor are you wedged within a tourist hotspot. You are close to Ubud's dining, art and culture, real coffee and fine dining when you want it but far enough away to escape. Step outside the Villa gate and you can stroll through endless rice fields or wander villages famed for their wood carving. Within a short drive are dramatic rivers, some of Bali's most famous sacred temples, relic sites and steaming volcanoes. And if your timing is lucky, you might even be able to witness a local ceremony. Rather than luxury, we offer style. We also offer heartfelt, unrehearsed hospitality from staff who live in the local village. Their languid pace of life revolves around devotion to their gods and sharing their culture with you. Jendela di Bali will not suit those who seek total silence or crave constant entertainment, nightlife and crowds. The owners created this property by hand over 10 years, working with Balinese artisans and craftspeople to create a 'village' of unique living spaces. They are passionate about traditional architecture, arts, tropical gardens and the local culinary flavours. Their goal was to create a window on Bali, which is expressed in the name 'Jendela di Bali'. The real story is not the owners but our wonderful staff (Dayu Made and Suertini, pictured, and their team) who live in the local village and whose languid pace of life revolves around devotion to their gods and sharing their culture with you. The owners wanted to create a secluded hideaway that was close enough to Ubud for coffee and cake, dining, dance performances, galleries and more - yet far enough away to be a real retreat from other tourists. The goal was to find a place that would allow our friends, family and guests to discover the genuine Balinese way of life. Our beautiful staff lovingly prepare a menu of simple but delicious Balinese and Indonesian-inspired meals for guests. Unlike many villas, we can offer all meals (breakfast is included in the rate and a menu offers lunch and dinner selections at a modest additional cost). We understand your desire to enjoy local flavours adjusted to western taste as well as the importance of quality and cleanliness in the fresh foods we present. We can cater in a modest and understanding way to special dietary needs, including gluten free and vegetarian cuisine with advance notice. The highlights are being located along a beautiful gorge for nature, near a sacred village for the insights into the religion, near to Ubud for indulgence and entertainment and set in the heart of Bali near some of the island's most significant and holy temples and relic sites. Most important to us however is how real and genuine the setting is - this is not a tourist enclave, it is not a hushed monastery, this is genuine rural Balinese life with all its sights, sounds, activity. We like to say Jendela di Bali is 'a place in the heart of Bali to discover Bali's heart'. We hope you'll join us and let our wonderful staff pamper you and share a little of their culture with you. Both bedroom bales have unique bathrooms. Please see images to ensure they will meet your needs. THE WHITE ELEPHANT BALE - A bathroom open to the deck: offers a shower-over-bath (privacy via modesty curtains to deck, shower curtain), ensuite (toilet, basin) in alcove. THE KINGFISHER BATHROOM - A unique bathing experience: Offers a shower-over-bath on the deck (privacy via deck blinds, shower curtain). Separate ensuite (toilet, basin) in rear. There is a third full bathroom in the Bale Bengong and a 1/2 bathroom is located in the back of the Wayang Kulit media/yoga bale. Set along a deep forested gorge within tropical gardens. Nearby, rice fields create a patchwork of verdant green and gold and there are rivers, temples & villages to explore. Located at the top of one of Bali's rare, high caste sacred villages with many other villages to explore and connect with Balinese and discover their way of life. Beautiful views of sacred Mount Agung can be seen from near the villa on rice paddy walks. Most of your meals will be prepared for you, but if you find something special in a market or store, you can share our fridge to store it. Dining can be in the Bale Bengong dining room or by the pool. We can also serve meals in your bedroom bale by prior arrangement. For all meals please ask for a copy of our menu to be emailed to you. With an extensive selection of Indonesian and English international news & sport channels, English movie channels, general interest channels, children channels and more. We have a small selection of DVD's to choose from. Unfortunately the undulating ground, changing levels and stepping stones make this inappropriate for wheelchair accessibility or the elderly. 7m X 5m, wet-edge black volcanic stone pool, 1.4m deep for easy enjoyment for everyone, with sun lounges and covered adjacent pool house open bale with daybed and chairs. The pool is yours to enjoy. You will have the exclusive use of the whole villa, whether you book one or both bedroom bales. Daily Menu - our beautiful staff lovingly prepare a menu of simple but delicious Balinese and Indonesian-inspired meals for guests. Unlike many villas, we can offer all meals (breakfast is included in the rate and a menu offers lunch and dinner selections at a modest additional cost). We understand your desire to enjoy local flavours adjusted to western taste as well as the importance of quality and cleanliness in the fresh foods we present. We can cater in a modest and understanding way to special dietary needs, including gluten free and vegetarian cuisine with advance notice. For a copy of our menu please click the 'Contact Manager' link and request a copy and we'll send it to you. For a guide to all the Sacred Sites, Attractions and Activities please click the 'Contact Manager' link and request a copy and we'll send it to you. This property is stunning! Totally private with well manicured gardens. The sleeping bales with so cool , you felt like you were in the jungle but with all the hotel amenities. The sounds of the birds and animals were so peaceful. The pool was beautiful, a tad cold but well kept. The best part about our stay was Dayu Made and her team. Truly wonderful, caring people. They were so helpful and wanted to please. Her cooking was outstanding and the service was excellent. Our driver was also warm and so helpful. All of them truly made our experience more special, they treated us like family! Would love to come back! Thank you!! Thank you for your wonderful feedback and we are delighted you enjoyed the very peaceful setting and service from Dayu Made and her team. Our aim at Jendela di Bali is to give our guests a very natural and authentic Balinese experience in a lush setting and we are so pleased you enjoyed the experience. You are family now and we look forward to having you stay at Jendela di Bali again soon! Warmest regards, Dayu Made and her team at Jendela di Bali. A really beautiful surrounding with verry friendly and excelent staff that made us feal right at home. They were really good chefs with excellent meals. Specialy liked the Ginger chicken ! Even the hired drivers were friendly and helpfull with info and tips over Bali. One remark has to been made, because due to traffic and infra structure it is always a long drive to get where ever you want to go! A special thanks to Agus from the booking office,with getting our lost luggage back on time after some difficulties with the Airline. I would recomment this beautiful plece to everyone ! With love and greatings to Dayu and Seuatine! We are so delighted you enjoyed your stay at Jendela di Bali and that you enjoyed the wonderful home cooking by Dayu Made and Sueatini. They send their love to your family and we look forward to seeing you back again soon. une villa de rêve dans un cadre sublime loin de toute agitation touristique . Et un personnel d'une extrême gentillesse se dévouant sans cesse pour aller au devant de tous nos souhaits . Nous avons quitté Jendela avec beaucoup de regret mais vraiment ravis d'avoir vécu ces 11 jours dans ce havre de paix .. It was a pleasure having you as our guests! Thank you for your wonderful review - we are delighted. Next time you are coming to Ubud Bali and looking for Ubud accommodation, it would be our pleasure to have you as our guests again. Dayu Made and all the staff at Jendela di Bali. "A dream villa in a beautiful setting away from tourist crowds. And staff extremely kind, devoting themselves tirelessly to reach out to all our wishes. We left Jendela di Bali with regret but really pleased to have lived these 11 days in this haven of peace...Many thanks !!!" Our location is a highlight of Jendela di Bali because we strike the perfect balance of being away from tourist hotspots, but close enough to visit Ubud for dining, coffee and cake, art galleries, dance performances and shopping. For a comprehensive guide to the sacred sites, attractions and activities near Jendela di Bali please click the 'Contact Manager' link and request a copy and we'll send it to you. THE WORLD HERITAGE LISTED PAKERISAN RIVER (5 mins) - Discover a world heritage gem and see Balinese worship and enjoy this fast-flowing river. WHITE WATER RAFTING (15 mins) - Join a tour and enjoy the thrill and adventure of rafting the Pakerisan River. GIANYAR NIGHT MARKET (15 mins) - Discover the flavours and colours of this renowned traditional night market. UBUD VILLAGE (30 to 45 mins) - For shopping, dining, dance performances, art galleries and more. Goa Rang Reng Waterfall and Cave (15 mins) - Bali has many waterfalls but this is a best-kept secret, with rapids formed by two rivers and a sacred cave to explore. TIRTA EMPUL SACRED WATER TEMPLE, Tampaksiring (15 mins) - Tirta Empul Temple is one of the important Hindu temples located in the middle of Bali. Tirtha Empul Temple was constructed during the rules of Candra Bayangsingha King of Warmadewa dynasty in 926 AD. The temple is a popular sacred destination where Hindu Bali people visit for purification rituals. According to a popular Balinese legend, the sacred water spring in the temple was created by Lord Indra and the waters have curative properties. GUNUNG KAWI, Tampaksiring (15 mins) - Gunung Kawi is an 11th-century temple complex in Tampaksiring north east of Ubud in Bali, Indonesia. It is located near the river Pakerisan. The complex comprises 10 rock-cut candi (shrines) carved into the cliff face. They stand in 7-metre-high (23 ft) sheltered niches cut into the sheer cliff face. These monuments are thought to be dedicated to King Anak Wungsu of the Udayana dynasty and his favourite queens. GUNUNG KAWI TEMPLE, Sebatu (25mins) - Not to be confused with Gunung Kawi, The Gunung Kawi Sebatu is a water temple built in homage to the God Wisnu (the preserver' who rules over water) and here one finds a number of natural spring and waterspouts and a wonderful pond with Koi. The Balinese believe that water is one of the forces of life. The etymology of Gunung Kawi means a fabricated mountain. It lies west of Sebatu village, which is elevated and its name means 'slipping on a stone'. GOA GAJAH (Elephant Cave) (25 mins) - At the façade of this fascinating cave is a relief of various menacing creatures and demons carved right into the rock at the cave entrance. The primary figure was once thought to be an elephant, hence the nickname Elephant Cave. The site is mentioned in the Javanese poem Desawarnana written in 1365. An extensive bathing place on the site was not excavated until the 1950s. These appear to have been built to ward off evil spirits. YEH PULU (25 mins) - Wonderful and sacred temple relief rock carvings discovered only very recently and dating from the 14th or 15th century showing a mix of Wayang Kulit (shadow puppet) figures and common people. TAMAN SAFARI & MARINE PARK (25 mins) - This is a credible and respected safari and marine park. TAMAN NUSA ARCHITECTURE CULTURAL PARK (25 mins) - For those interested in traditional architecture of Indonesia this park is a must-visit. MOUNT BATUR VOLCANO, Kintamani (35 mins) - Experience the awe of an active volcano. Caldera trekking tours are available or simply drive into the caldera and discover lakeside villages. BALI BIRD PARK (40 mins) - A beautiful parkland garden setting with lakes and a stunning collection of birds including the rare Bali Starling. We are closer to many of the above attractions than staying in Ubud or down south and there are many more places of cultural and religious significance too numerous to mention, all within easy reach of Jendela di Bali. All of the above can be easily reached with arranging a car + driver hire, which we recommend to all guests. Jendela di Bali is managed by Individual Bali Hospitality who can arrange car and driver hire and tours for guests.